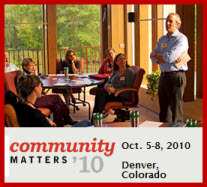 Reflections on 2010 Community Matters Conference and Answers to Questions was written on December 22, 2010 and filed in All, Inclusion, Issues Forums, Participation 3.0, US. Editors Note: The other month we received an invitation to have a booth in the “sandlot” at the Community Matters conference. Because I’ve been in occasional contact with the head of the Orton Family Foundation, I suggested that we could step that up and also host a virtual round of introductions. The exchange, using our simple and effective online groups technology with human facilitation, generated about 70 excellent introductions which jump started the in-person conference before people arrived in Denver. We did this successfully with the first CityCamp unconference last year as well. The CityCamp Exchange has evolved into a model dynamic ongoing exchange. This was one of our first booths “out in the field” so to speak. My primary goal in sending Boa and Julia was to help raise awareness of our Inclusive Social Media efforts in lower income, high immigrant neighborhoods with a new constituency. I’ll let them share their reflections before closing the post with some further comments and answers to questions they received. In the last year with our push into neighborhood-level work, I’ve come across a number of “silos,” if you will, of community builders ramping up their use of social media and Internet-mediated knowledge exchange. The more planner-oriented Community Matters network (also note the Planning Technology online group) those in public health with the Community Toolbox, new efforts to share local “what works” story sharing fostered by the Craigslist Foundation (more from their labs on the new LikeMinded project), networks in the UK on “neighbourhoods” and now the “Big Society,” those working from civic engagement and deliberative democracy or community dialogue frames, and the Locals Online and CityCamp movements and related uses of social media in neighborhoods often led by technologists are all doing their good work in relative isolation. However, with the excellent silo-busting OurBlocks.Net blog led by Leo Romero and our own interest in convening across fields, the awareness and synergistic connections among these actors presents a terrific opportunity. OK, Boa and Julia didn’t know they were part of some multi-year grand scheme to network local community builders, but we need to get out more among these networks at in-person gatherings like CommunityMatters to introduce our own work and connect everyone seeking to use technology to build local community and democracy. The Community Matters Conference provided an opportunity for us, Boa and Julia, to take stock of our e-democracy outreach efforts. It gave us insight as to what types of background training will be required for communities around the nation to be able to understand and utilize Neighbors Issues Forums in a meaningful way. While both of us agree that the CMC was a great processing tool for community organizers to engage in community planning, we found that we were not adequately prepared for the audience niche. The conference was attended by mostly planners, elected officials and individuals working in and with government. Most of the entities came from smaller towns and our inclusive engagement work comes from the urban inner city. From our work in St. Paul and Minneapolis, we know that local communities have already established the importance of being and staying involved using the Internet and its social media tools; for communities we are familiar with has been to increase the number of diverse voices in community and city planning. We spoke to several people at our “sandbox” (an interactive conference booth time), however many of them were from communities working on new comprehensive plans, thus they were at the conference to seek Geographic Information System planning resources. Certainly, the majority of the tools in the sandbox were applications that a planner would use to aid in helping communities envision economic development projects, beautification projects and the like. We wondered if Neighbors Issues Forums could be implemented into some of these platforms to serve as an auxiliary communication tool. We suggested to several of the participants that e-democracy would serve as an effective comprehensive platform for neighborhood communication and collaboration. As mentioned, the deficit in our participation at the conference was that we weren’t adequately prepared to deal with our audience. This being our first time at the CommunityMatters conference, we did not know the background and demographics of most of the attendees. While we did sell certain attributes of Neighbors Issues Forums — including that it is a simple interface, has a low learning curve for computer illiterate individuals, comes with email capability, and that it requires real name use which demands accountability – it would have served us better to have tailored our message to the attendees so we could meet them where they are at. In the future, we suggest that whenever we attend conferences, we consider the expected audience: who they are, where they’re from, their comfort level with technology, what value they place on community engagement, etc. We also realized that in order to help people appreciate the value of a tool like Issues Forums, we must first broaden our scope of presentation to include topics like transparency/open government, civic engagement and technology/social media. We must be cognizant about framing our discussions around why we exist — E-Democracy.org’s mission — in order to connect with our target audience. 2. Can we have a non-geographic group (esp. a group for people working on public health issues)? 3. How is E-Democracy.org different from FrontPorch? 5. How many people do you need in order to start your own forum? 6. Can E-Democracy.org incorporate Google Translator? 7. How does a politician (city councilor) seed information without getting political? 8. Can the forum be part of an organization’s already existing website — added to and not just linked? Thank you Boa and Julia for charting our foray into broad lessons sharing. In 2011, we will be gathering up our Inclusive Social Media lessons for a virtual and sometimes in-person roadshow at conferences an the like. Here are my answers to some of the questions you received. Answer: It depends. Volunteer Forum Managers who are willing to recruit 100 initial participants may start a group for free. Here are tips on starting a Neighbors Issues Forum. We’ve found this works well in areas with high home ownership. With volunteers leading the way, a shared technology base, peer to peer support across communities, etc. our cost structure is extremely low by design. However, if you want to start a forum with real inclusion efforts in lower income, highly diverse areas, then this is where we recommend funded initiatives. Whether $5,000, $20,000 or something more for one or more forums covering 5,000 to 20,000 person population neighborhood areas each, the real cost is just how inclusive do you want to be assuming the most of your inclusion success will come from more traditional in-person community organizing. Adapting our print materials – particularly the paper sign-up sheets – for use with us or your own independent effort is encouraged. Without paper sign ups we would fail. Period. Perhaps. We see as real market failure in common interest networking based on geography. In general it is my opinion that attempting to create a niche online interactive experience narrow-cast to a specific local community silo requires extensive resources. Getting 300 people into an online space is like pulling teeth even with people who are interested in the issue. The public needs a compelling self-interest to join if you want to get beyond the 1% “political class” that shows up already. So our magic lesson – people love – L – O – V – E -multi-purpose Neighbors Issues Forums – our largest two to three year-old forums have attracted over ~15% of households in our public spaces online in Standish Ericsson and Powderhorn for example. By opening up to “who can recommend a good plumber” our discussions of more civic issue topics now have a far broader audience. I recommend that every community foster and support a distributed network of neighbor to neighbor spaces online (they will not all be on the same platform, but we’d be glad to host anyone) that are there on a sustained and useful when you really need them basis – like when your community seeks to respond to violent crime or when a government consultation is seeking input from the public by coming to an online forum just as they would come to existing community meetings. With lots of Vermonters connected with the Orton Family Foundation where they and FrontPorch are both based, I figured this question might come up. E-Democracy.org comes of a civic engagement background with expressly public forums. We started statewide in Minnesota in 1994 with the world first election information website and in 1998 started with the Minneapolis Issues Forum on city politics. We were discovered by the British government and our model was taken to the UK and refined with some neighborhood level forums. We’ve brought Neighborhood Issues Forums back to our strong-hold of Minnesota with great success. Expansion continues. We consider our friends at Front Porch Forum as peers in the Locals Online movement. While they are a business and we are a 501.c3 non-profit, we both generate significant income from grants. The biggest difference is that our Issues Forum model is expressly public by design, covers 5 to 20,000 residents (compared to hundreds of households in Front Porch per online group – however Front Porch currently has more users overall all in Vermont) in each space, each our forums has a dedicated volunteer facilitator connect to other volunteers for peer to peer support, and it is free to communicate city-wide via our complementary city politics forums. As I understand FrontPorch, each forum is limited to residents of a specific area, you may join and post to only one area, and the exchanges are private (or at least not in Google and each to discover through search). We see value in both models and in fact are exploring an private tier of communication in the form of electronic block clubs that are even smaller areas than Front Porch Forum in an effort code-named Neighborly that will connect up into our and others’ public online community spaces. Our biggest concern is that without real investment in more labor intensive inclusion efforts, commercial models may only serve higher income areas. We doubt this is the case with FrontPorch’s business model, but with many top-down commercial entrants like Patch.com they (coming from an online news approach) are cherry picking wealthy communities. We don’t need a new form of red-lining based on social media in neighborhoods. Can anyone commercial or non-commercial inclusively network neighbors online on an ongoing basis without some form of subsidy – be it volunteer labor or grants, etc. – that serves ALL communities or can scale beyond their boutique level of service? We do not know, but we sure are 17 years into making something important happen with an attention to civility and quality exchange versus “we take no responsibility” models filled with diatribe and conspiracy (like most anonymous online news commenting on anything political or crime-related). In the end, this is a huge country with room for many models and providers. 100. See our giant guidebook for all sorts of start-up tips. Why? With 100 people you’ve done real outreach. You have a large enough group that replies are likely. The 100 people are actually the “network” and not the end points. Each person connects to their friends, families, co-workers, community groups and more off-line and online. Good idea. We are experimenting with a link from our Powderhorn forum to a Spanish version via Google Translator. Another option would be to add a auto-translation links in more places. If only Google translated into Somali and Hmong. Politicians post to our forums frequently. Here are some tips specifically for elected officials that we are drafting. Many politicians are concerned about being criticized in public and we work to make the forum’s reach powerful enough that they see pragmatic value in using the forum. It helps that at the neighborhood level, local elected officials can say these are my voters. We also have tips on information seeking and seeding. Note my post about the “community information stream” to the Locals Online group. While we have had partners help start-up new forums with links and credits, we don’t host generic version of forum like a general technology provider (we do host some interesting online communities of practice like the CityCamp Exchange with their logo, etc.). If you like our technology but what to roll your own thing, you could ask our host OnlineGroups.Net to host something using your site’s look and feel. Also, we do provide consulting services for other groups seeking help with online events and facilitation. Our 17 years of experience can be applied in many settings online and best of all, the revenue generated supports an awesome mission and our public work.